FREE Pokemon Trade & Collect Event At ToysRUs! May 13 Only! You are here: Home / Dallas/Fort Worth Events / FREE Pokemon Trade & Collect Event At ToysRUs! May 13 Only! May 13 Only! 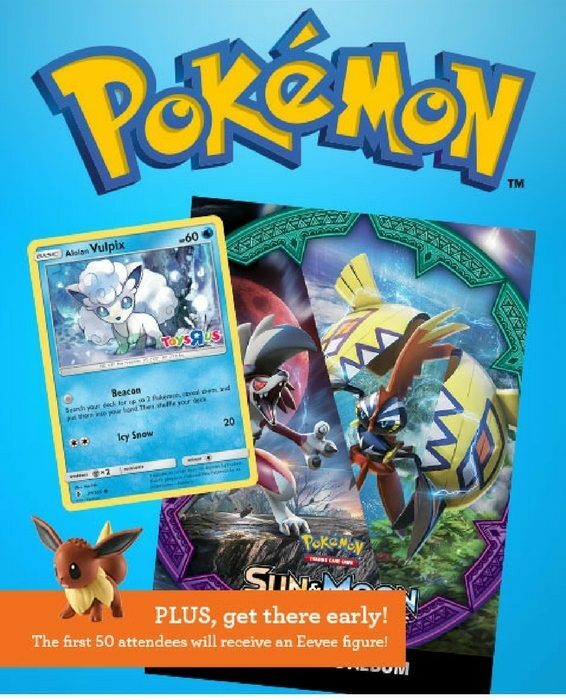 ToysRUS is having a Pokemon Trade & Collect Event on the 13th of May at 1pm to 3pm where you can get a chance to win a FREE Pokemon Alohan Vulpix Foil Card, Pokemon TCG Collector’s album and many more! PLUS, they will be having a coloring activity which your kids can join! What’s more amazing? The first 50 attendees will receive a FREE Eevee Figure! This is so cool! Make sure to get there as early as you can! Save The Date so you won’t miss this awesome event!